August products are made to keep your home secured and protected. August Doorbell Cam is just like that since it enables you to always know who’s in front of your door. 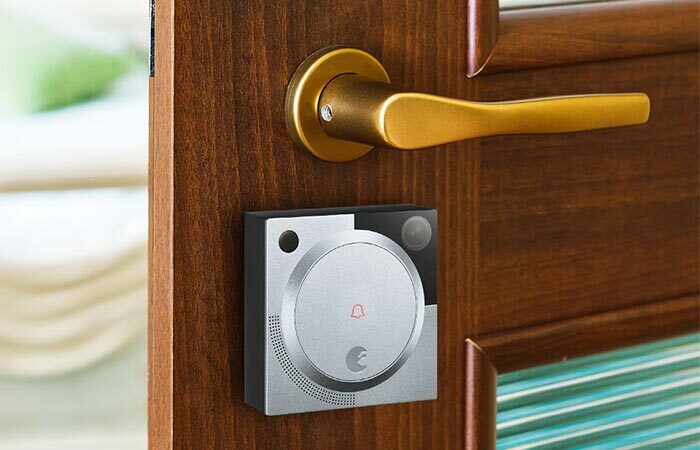 August Doorbell Cam uses Bluetooth connectivity to connect to your smartphone, so as soon as someone rings the bell, you will be alerted. Then you can use the smartphone to speak to the visitor. This is very convenient since you don’t have to be home to see who’s there and you can answer even if you’re far away. In case you’re not home, to connect to the doorbell cam you can use your home wifi network. August Doorbell Cam allows you to see and speak with visitors at your door even if you’re not at home. The one-way HD camera will provide a clear image of the person and they don’t have to ring the bell to get noticed. August Doorbell Cam detects motion, so you’ll get an alert anyway. This is very useful for potential burglars. Also, with on-demand video option on the app, you can connect to the live video feed anytime, or if you missed something, there’s always a replay option. August Doorbell Cam features a one-way HD camera. As soon as it detects motion or someone rings a bell, you’ll get notified through a smartphone app. The doorbell cam can be combined with the August Smart Lock so you can use the same app to unlock and lock the door. In the box, you will get everything necessary to set up the doorbell cam, from mounts, screws, wrenches and wedges to wire connectors. August Doorbell Cam is available in four colors- silver, dark grey, red and gold. Make sure to check out this video and see how August Doorbell Cam works.